The institute BIL provides Free Education to Deaf children from Pre-Primary to Class XII, between the age groups of 4 to 18 years. These children are from economically poor families and come from great distances as far as , Haridwar, Mussoorie & beyond. . The institute also provides vocational training in various disciplines such as Computer Applications, Tailoring, Confectionary & bakery. 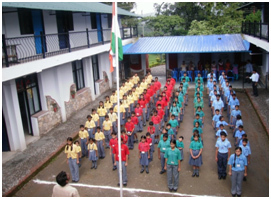 All schooling is conducted under the NIOS pattern. BIL is one of two schools in India to offer higher education to the Deaf. It has a state of the Art resource centre for testing, & certification, of DEAF in the State. A Boys Hostel built over 4 years ago for BIL was a Boon and an answer to the many prayers of Deaf students residing in other parts of the country who had aspired to join BIL to avail of the premier education facilities offered at the Institute. How you can help BIL ? The Bajaj Institute of Learning imparts education and vocational training to deaf students. The annual expense which includes salaries to faculty, administration and maintenance costs to name a few, amounts to several lacs of Rupees. Your donation will go a long way in helping the Deaf. * Operational costs of the institute. * Supporting the students in education or vocational training. * Offering job placements to qualified students.